Today at 4:52 in the afternoon, the Place Joseph Bermond was empty. The square is named after a politician who was born in Valbonne in 1853 and died in the same place in 1957, aged 104. 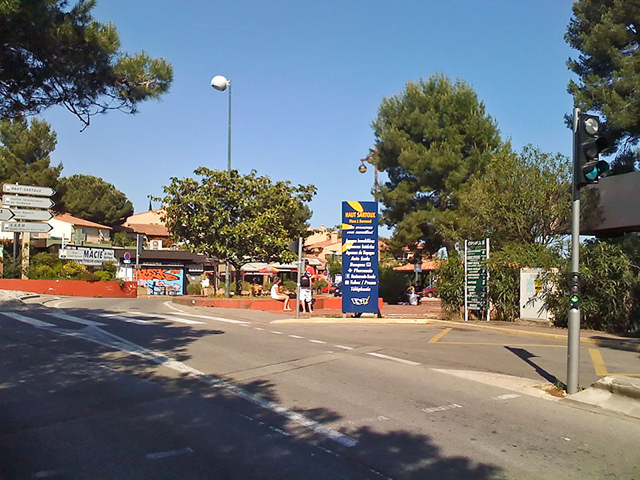 From 1900 through 1936, Joseph Bermond was mayor of Valbonne, and I am certain he would not be thrilled to know that the square bearing his name is famous for having the only traffic light in the park of Sophia Antipolis. Indeed, most of the traffic around here is regulated by roundabouts, and it is possible to drive from this square to the airport, some 24 kilometers (15 miles) away, without encountering a single traffic light. There are many things about New York I do miss, but traffic lights are definitely something I can live without.